Jakarta: The Indian players were off to a great start at the the BANK BRI Indonesia Open here today, with three of them figuring in the top-10 at the end of the first round. Arjun Atwal, who has been playing in Asia for past few weeks, shot a bogey free 67 and was tied third, while SSP Chowrasia, who has had some very good starts recently, had another with a round of 68, as did his Kolkata teammate Rahil Gangjee and both were tied seventh. Incidentally, Atwal, too, is from Kolkata, but now lives in Orlando. Gangjee had five birdies against two bogeys while Chowrasia had four birdies against one. 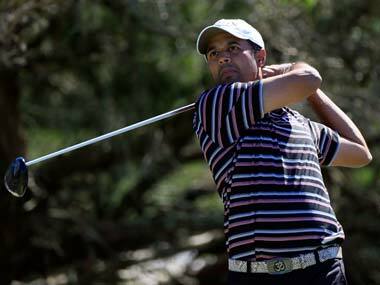 Swede Daniel Chopra, also focusing on Asia recently, shot 68 to be tied seventh with. Among other Indians, Anirban Lahiri had a rough start with a card of three-over 74 and he was 90th, needing a good second round to make the cut. Chiragh Kumar and Jyoti Randhawa fired even par 71 each to be tied 40th, while defending champion Gaganjeet Bhullar and Himmat Rai carded 73 each and were tied 75th. Young Shubhankar Sharma shot 74 to be 90th. Kalem Richardson of Australia fired a superb eight-under-par 63 to lead by one shot over three-time Major winner Padraig Harrington of Ireland after the first round. Atwal, who was Asia No. 1 in 2003, said, "I hit it pretty solid. I'm happy with my score and I have no complaints. I didn't take advantage of the early start. I didn't make a birdie after six holes but I stayed patient and tried to hole some putts. "My game is getting better every week. I haven't played so many weeks in a row since the last two years. Every day I'm learning something new and I'm getting better every week. see where my misses are. I'm just trying to manage that. That's what I'm learning about myself." Richardson, who has two top-five results in his last three events, rolled in eight birdies, including a 20-footer on the last hole to steal the limelight from Harrington, who is making his debut at the US$750,000 Asian Tour event. The three-time Major champion, produced his best score in 2014 with a 64 after birdieing his first two holes from close range at the Damai Indah Golf – PIK Course. Australia's Adam Groom battled through a leg infection to return with a 67 to tie for third place alongside India’s Arjun Atwal, Thanyakon Khrongpha of Thailand and Bryce Easton of South Africa.